B.C. does not seem to sell beer in small vessels. When Teena came home from B.C. on Monday, she had 6 beers for me in her suitcase but it was so heavy she had to remove some clothes. I always appreciate that she does these things for me. Five of the bottles were 650ml but I had to laugh when she pulled out the Howe Sound Devils Elbow IPA as it came in a full litre bottle! 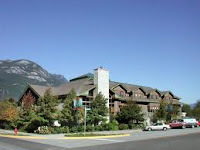 Howe Sound Brewing is also an Inn located in Squamish, B.C. It looks very scenic! The brewery does come with a pedigree too. In 1980, John Mitchell and Frank Appleton fought the provincial regulators and finally managed to open up North America's very first craft brewery on Horseshoe Bay on Howe Sound. As a side note, Howe Sound is North America's southernmost fjord. I didn't know we had fjords in Canada! John Mitchell helped design the Howe Sound Brewery when it opened in 1996 and was their first brewer who developed many of their original recipes. He keeps an ongoing relationship with the brewery to this day. 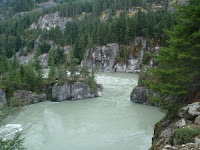 It is named after the Devils Elbow rapids (pictured down to the left) which is a grade 4 rapid on the Elaho River, jus t north of Squamish, B.C. It pours with a big head, that takes a long while to disappear, leaving behind a large amount of lacings. It is brown in colour and I can sense a hop note in the aroma. Much like other IPAs I have tried, the better ones, the flavours change during the process of a sip. It starts with a nice bitterness and then morphs into something else, sweetness maybe, before the hops take over in a very long enjoyable finish. I really liked this beer and would not hesitate to try others that come from Howe Sound. With 1 litre bottles, though, it would be difficult to down a 6 pack in a day! If you get a chance to try their Total Eclipse of the Hop Imperial IPA I would jump at it. It's an amazing beer!